Authors: Tara Murphy, et al. Astrobites is no stranger to exotic exoplanet discoveries– the Kepler mission alone has increased our knowledge of these worlds by leaps and bounds, and many exciting discoveries have been done by optical telescopes as well through a variety of methods. In today’s paper, however, the authors present results on yet another method of extrasolar planet detection: the possibility of discovering planets in radio frequencies. How does this work? Well we know that planets with high magnetic fields can give of gigantic radio flares in the right circumstances- in our own solar system, Jupiter gives off flares that can be brighter than the sun in radio frequencies thanks to its powerful magnetosphere (which produces bright aurorae like Earth’s magnetosphere- see Figure 1). This is thanks to something called cyclotron maser emission, where electrons from plasma material interact with the magnetic field in a way that beams them like a laser in radio frequencies. In the case of Jupiter, these bursts are visible from Earth when Io– the nearest Galilean moon to Jupiter, which is constantly spewing out material from its volcanoes- is at a particular point in its orbit and this beam of radio radiation is pointed towards us. Of course, if such a thing is a well-documented phenomenon in our own solar system with Jupiter, shouldn’t it also occur around other planets? Astronomers think so, and such flares have been observed from brown dwarfs, but the question is whether these exoplanet radio flares would be strong enough to be detectable from Earth. The answer is “perhaps,” under circumstances such as if the exoplanet is much bigger than Jupiter and closer to its parent star, which could also provide material for cyclotron maser emission to happen. Such a discovery would be very important because it would tell astronomers new information about exoplanets we can’t learn about in optical frequencies, such as details about the exoplanet’s magnetic field. Today’s paper focuses on one search for these radio exoplanet flares, with the Murchison Widefield Array (MWA) in Australia. This team targeted 17 known exoplanet systems in the southern hemisphere, 13 of which had not been targeted before for radio observations. The team used data from a MWA radio survey of the sky, observing at 151 MHz. At such a frequency, an exoplanet’s magnetic field would have to be four times that seen from Jupiter. Unfortunately, no emissions were observed from any of the exoplanet systems in this survey. Figure 2: Limits on implied magnetic field strength of exoplanets, based on luminosity limits found by this and other surveys. 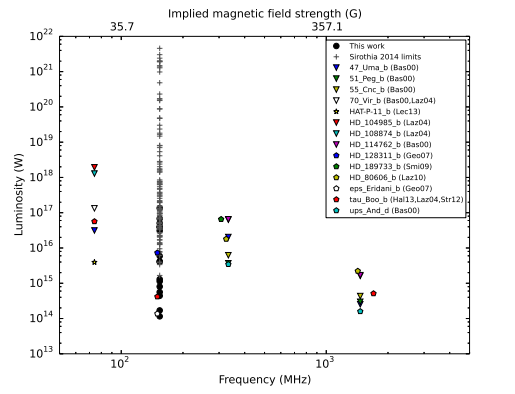 Because of the null detection, however, the authors were able to set limits on the strength of magnetic fields from exoplanets based on their observed luminosities (see Figure 2). This shows that the MWA observations are on par with those of previous surveys for these exoplanet flares. The authors say there are also several reasons for why nothing was detected by their survey: a lack of sensitivity is an obvious one, and second their observations were at a slightly higher frequency than most emission expected from these exoplanets. (Jupiter, for example, flares in the 3-40MHz regime.) In the future, the MWA group plans to observe at a lower frequency of 90 MHz, and other groups (such as those using LOFAR) are also searching for exoplanet flares. Hopefully soon, with a bit of luck and a lot of patience, astronomers will find one! I am a third year PhD student in radio astronomy at the Anton Pannekoek Institute at the University of Amsterdam in The Netherlands. I work with Ralph Wijers on searching for transient radio signals and probing the low frequency radio domain with LOFAR. Originally from the USA, I did my B.Sc. and M.Sc. in physics at Case Western Reserve University in cosmic ray research. Other than Astrobites, I also occasionally write for Astronomy and Sky & Telescope.